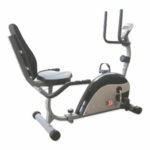 Does This JLL JF150 Home Premium Exercise Bike Appeal To Intermediate Users Too? 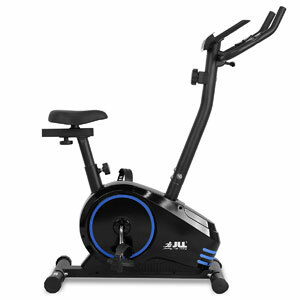 The JLL JF150 Home Premium Exercise Bike is a good looking bike with some nice features to appeal to the typical buyer – from the compact shape to the 5kg flywheel. Yet, there is the sense from the product description for this bike that this is a model that takes a basic, familiar exercise bike and elevates it slightly from a beginner level. The claim is that this is ideal for “beginners to intermediate cyclists”, but the little details hint more towards the later. Is this the experience of users, or is this still just a beginner’s bike? What benefits does this JLL JF150 offer to both beginner and intermediate users? This bike has a great look that immediately suggest a gym-quality option for the home. There is a sleek shape, some nice design elements, colour choices and little details. This familiarity appeals to newcomers, but there are little details that push this further. This include the breadth of the magnetic resistance, the use of the 360 handlebars for a better posture and cycling position and the heart rate sensors to help with cardio monitoring. Some say that the heart rate data can be a little erratic, but other find this data – and the other details on the console – to be of use. Still, there are also all the creature comforts and other elements that ensure that this is an accessible, appealing option for a wide range of users. The JLL exercise bike has plenty of adjustments on the seat, a strong user weight allowance of 100 kg, a motion designed to be gentle on the joints and even a tablet holder so users can watch tv as they ride. There are also those that mention the lack of noise produced and the sturdy feel, which suggests high quality parts. Are there any important issues with this JLL JF150 Stationary Bike ? The vast majority of users of this machine are very happy with the performance and design, and are happy to award 5 stars for their experience. However, there are a few that struggled with the assembly process. Most of the elements and steps aren’t too difficult, but they can be time consuming. The exception is the wiring process, which isn’t all that intuitive. Some had to turn to online video guides to help them out. Other than the usual issues with seat adjustments for the larger and shorter users, most seem to use this machine with few issues at all. 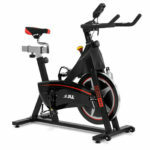 Summary: does this lack of negative feedback mean that the JLL JF150 Intermediate Exercise Bike is easily recommended? It is easy to recommend this machine because it meets that initial expectation from the sales claims. There was that sense of a machine that wanted to go a little further than the typical beginner bike for slightly more experienced users. That is precisely what users get. There is the comfort, low-impact motion and security for the typical user, but the range of resistance and data for those that want to be push a little harder. 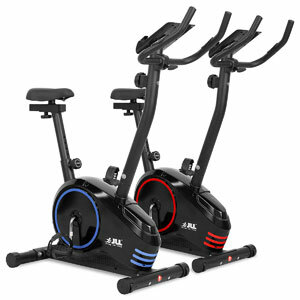 Therefore, the JLL exercise bike is a great model to progress with in the comfort of your own home. 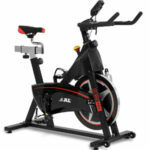 You can check out more customer reviews about the JLL Home Premium Exercise Bike JF150 on Amazon here.